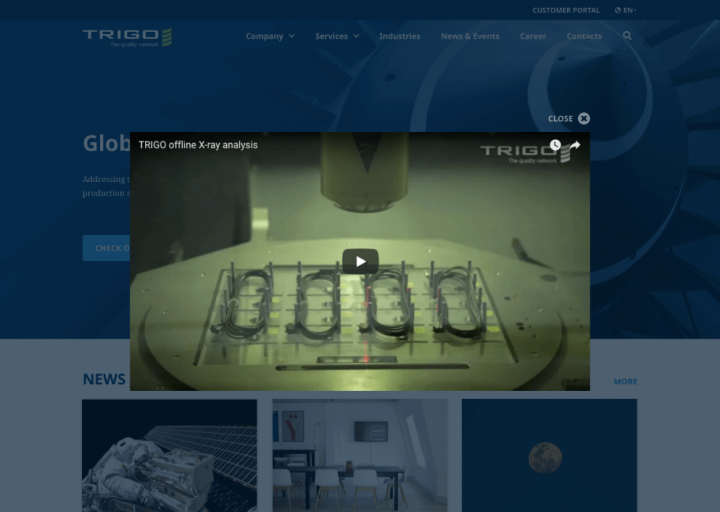 TRIGO Group offers quality solutions, mainly focusing on the automotive, aerospace and other transport industries. With more than 10.000 employees worldwide, it offers a comprehensive portfolio of inspection and management services to various supply chains, it is the world’s largest player in the quality sector. 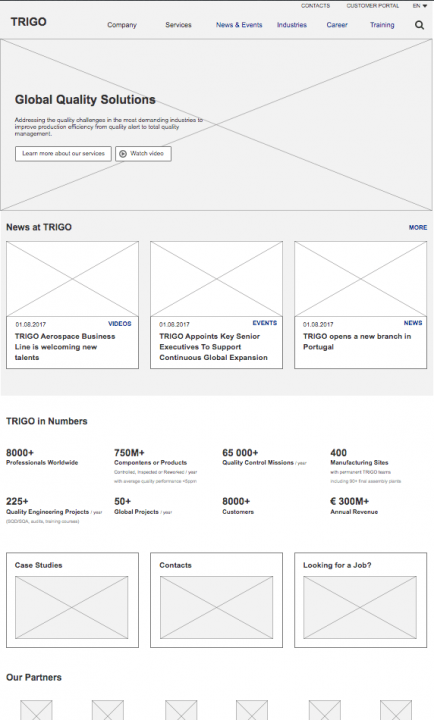 Here’s a peek at the old TRIGO website. To reach the top of the quality assurance industry, you need a top website. 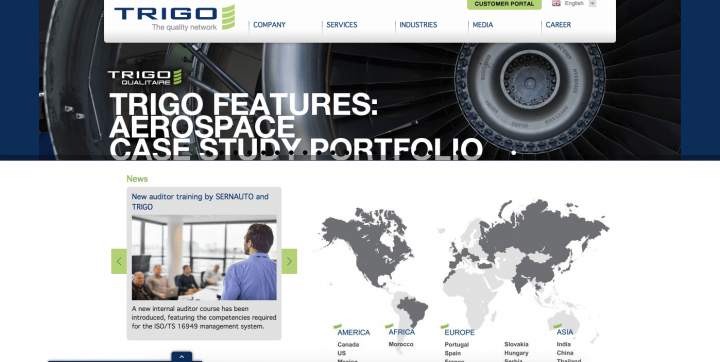 The project scope covered redesigning the website. The old website didn’t meet business requirements, which meant they needed a complete redesign. I as the UX researcher held responsibility mainly for finding user needs (mostly usability wise) and aligning the needs with the business goals. The other designer dealt with providing design solutions, creating the artboards and working with developers. Good business website design tells as much as possible about the company, even at first glance. But it does more: it makes the experience easy and informative for the user. 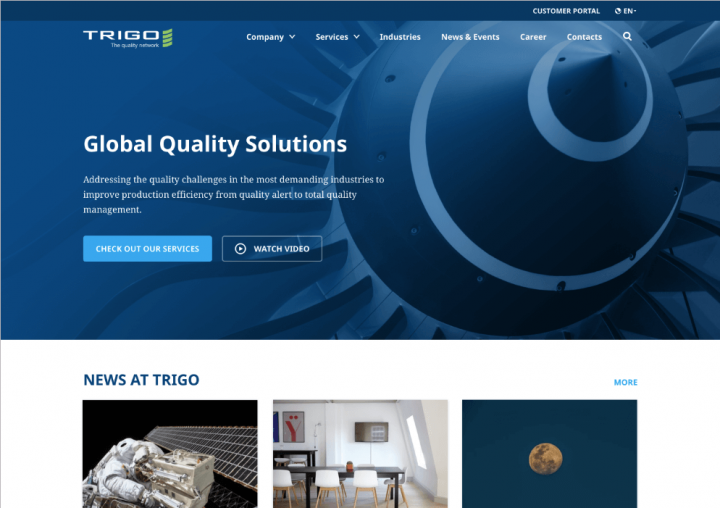 TRIGO wanted a website that holds all the necessary information for prospects, represents all the values the company stands for, and finishes it all off with a refreshed, modern design. Here’s how we made that happen. The whole project comprised of three major sections: exploration, execution and development. Below, you can see the detailed project plan. Note that in some cases, design phases overlapped a few days or even weeks. Otherwise, we kept to this. We recently wrote an ebook: “Product Managers’ guide to UX design” about our process. Click here to download! We gathered information about the market, the product and the users. 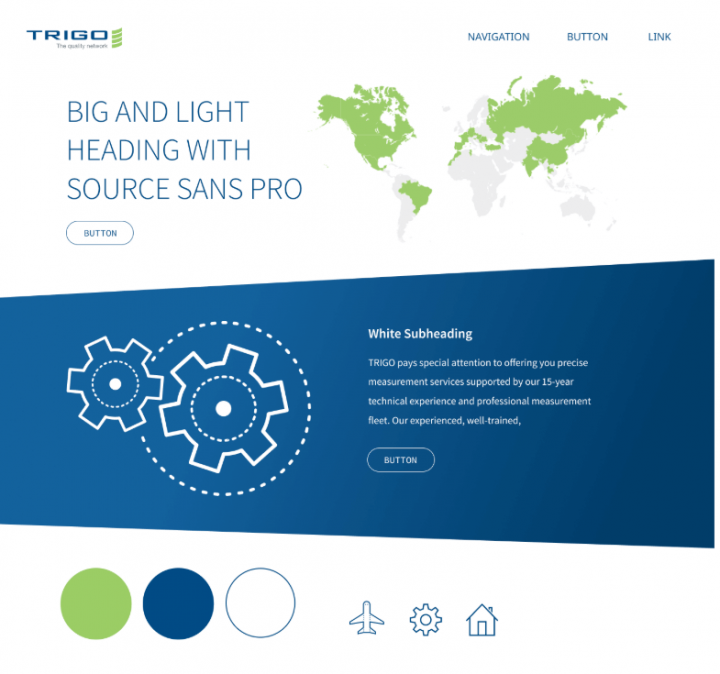 We first focused on the aim and functions of the TRIGO business website. Design was present as well, however, mainly in the form of wireframes and moodboards. To get insight into the market, we did a competitor analysis of all the major players. We also talked with people who had worked for competitors or other companies that had. To get more insights into the product, we conducted a series of internal interviews with the stakeholders and six executive-level leaders during multiple sessions. We involved the users in the later stages of this phase. We identified and created profiles of future users. Then testers fitting these criteria tested the ideas and concepts throughout the exploration and the coming execution phase. The exploration phase focused on the concepts. We tested different ideas, e.g. variations of grouping the different services. We wrote extensively about UX research and competitor analysis before, make sure to read those articles as well! In this phase, we also created and delivered design such as Look&Feel artboards and design sketches. However, we later made major changes to the design delivered in this phase. Below, you can see some examples of the moodboards we came up with for TRIGO. 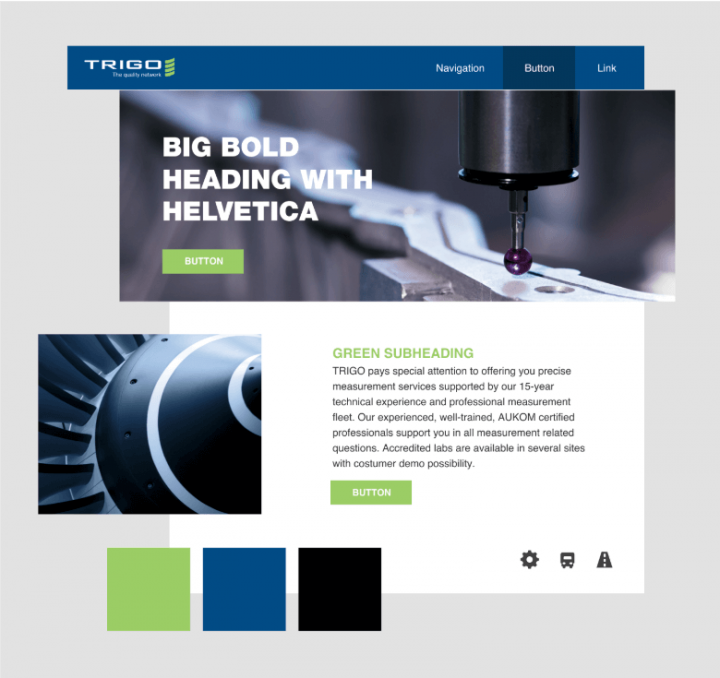 At the end of this phase of the TRIGO business website design process, we had an Axure prototype of the main parts and the navigation. Later, we added new elements but the navigation and structure didn’t change radically. Clickable prototype of the website created in Axure. Want to learn more about the exploration phase? Read about the importance of prototyping and customer journey mapping in our other blog posts. We had to convert all the information we gathered during exploration into the product. In this phase, we knew what needed doing and we just had to focus on the how. 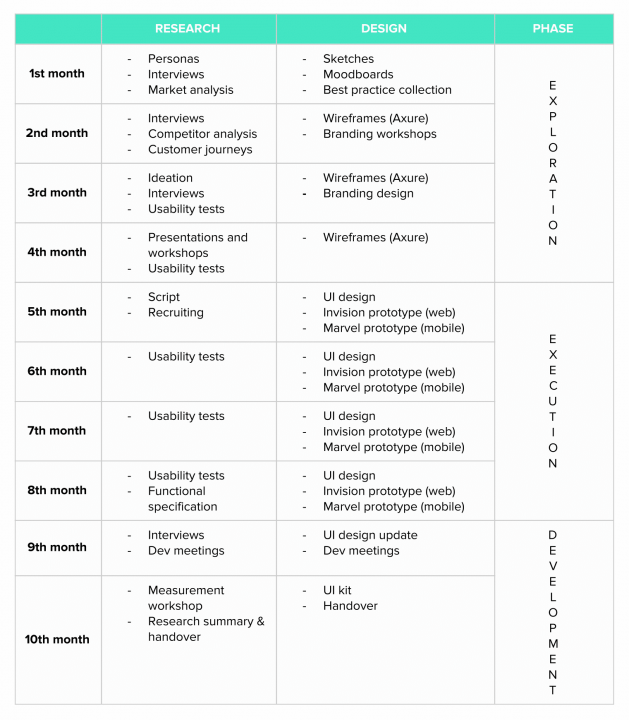 At UX studio, we have a design sprint each week, followed by an iteration. This was no different during the business website design project, either. At the beginning of the week, we held a starter meeting when we also planned the smaller tasks (according to the roadmap). Then, we went through our list of tasks (e.g. change the position of two items or add a button or video thumbnail). When we had implemented all the changes, we then tested the new design and adapted it based on the insights gained. And so we came to the end of one week and repeated the process the next. Many meetings made up this phase, most of them internal (UX researcher + UX designer). However, we also had to check on our weekly progress with the client, mostly with the marketing team, sometimes also with the stakeholders. During the meetings, new ideas and even new business goals came up that we needed to incorporate into the design. Example of cool interactions: here’s how videos are embedded. When we reached this phase, we had 99% of the design ready and needed to just fine-tune the other 1%. So, we could say our work there was done, right? No. We know a good design also takes technical limitations and solutions into account. Here, “limitations” don’t refer to feasibility — any business request has a technical solution. Rather, I mean cases where something merits the effort (e.g. integration of image gallery template instead of coding one from scratch). Also, when we use templates (or widgets/plug-ins) of any kind, we have to make sure to test every aspect (navigation, fonts, colors, icons, etc.) that it fits the design rules and the branding. 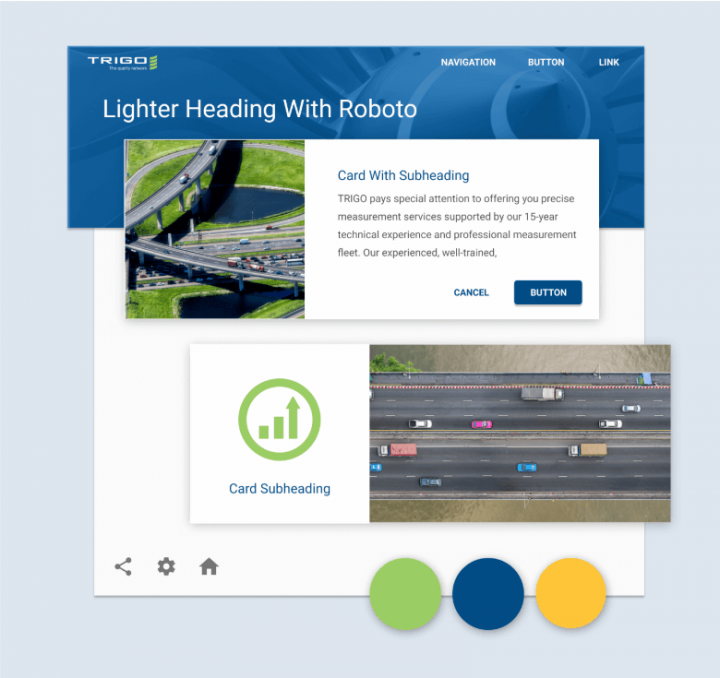 In the final two months, we did follow-up development, made design changes (if needed) and represented the business and the user needs in the design. The last part featured in case the developers wanted to modify the design. Our designer Katica just wrote an article on improving the design handoff process. Read it if you want to learn more about the ideal designer-developer collaboration. Here at UX studio, we mainly design digital products that usually have more complex functionalities than “simple” corporate website. But this project is also proof that no matter the platform, or purpose, user experience is key, and it is always complex. Creating great business website designs is hard, and it’s a long process. Website redesign involves more complexity than appears at first glance. Make it clear what will change with a website redesign (not a facelift). 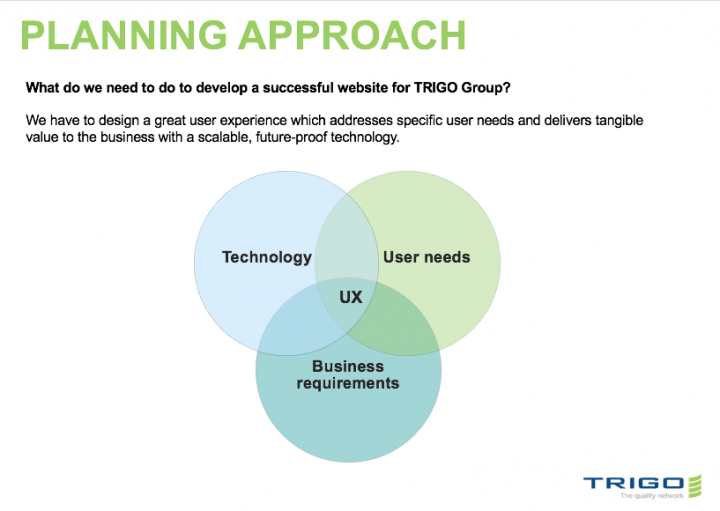 Holy trinity: user needs, business requirements, technology. Involve developers as soon as possible, and continuously. TRIGO’s developers are currently working hard on finalizing everything, so the updated website can go live. So, stay tuned! Until then, let us offer a bit more reading for those eager to learn more about UX! Check out our free e-book, the Product Manager’s Guide to UX Design. In this, we describe the basics of our process. Our CEO David Pasztor actually wrote a whole book about it as well. Buy the hard-copy Product Design book today — with free shipping to Europe and the US. Have a thought about the article? Let us know in the comment section. In need of UX design services, or a free UX consulting session? Reach out to us! Want to receive UX and product design content every week? Sign up to our newsletter!